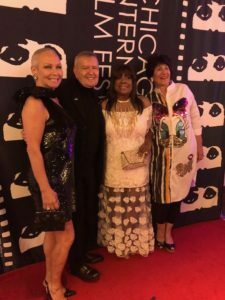 “Celebrate Michael” In Chicago on July 14, 2018 celebrated Michael Kutza’s retirement as longest-serving Artistic Director of a Film Festival in North America. 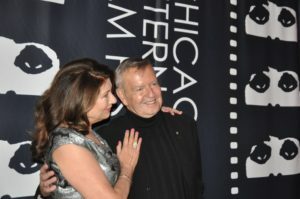 Michael Kutza, Founder and Artistic Director of the Chicago International Film Festival for the past 55 years, was feted at a gala celebration at Loews Hotel, 455 N. Park Drive, in Chicago on Saturday, July 14th. Michael Kutza with Paula Wagner, producer of the “Mission Impossible” films. Those present to honor his legendary career as the longest-serving Artistic Director of a Film Festival, (which is also the oldest Film Festival in North America), included Producer Paula Wagner, known for her collaborations with Tom Cruise on the “Mission Impossible” series (among others); Kathleen Turner, star of “Body Heat,” “Romancing the Stone” and many other films; Andrew Davis, Director of “The Fugitive”, Joe Swanberg, Steve James and many others. Kutza started the Chicago International Film Festival in 1962 as a 22-year-old film buff. Phone call from the babysitter. (Photo by Connie Wilson). Chicago International Film Festival, but expressed admiration for Kutza’s contributions to cinema in Chicago. He also told Chinese/American interviewer Meiling Jin that family was important in delineating a character, as it formed the basis for all human emotion. Meiling Jin has been interviewing celebrities in the United States since high school and now, at 27, is listed as the 91st most influential media expert on films for a Chinese audience, with millions of hits daily. She also models and serves as CEO of Meiling Jin Television and Video Productions. 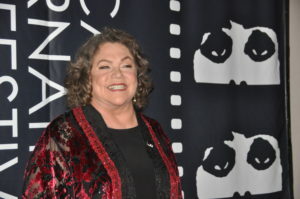 Kathleen Turner (Photo by Connie Wilson). Kathleen Turner, in speaking with me, advised that “Less is more” (Mies Van der Rohe) in acting and urged directors to “trust their actors,” but also suggested that a screenwriter might wish to think about the many sets or set-ups in writing a screenplay. (As a Finalist in several screenplay competitions right now, including the Windy City Film Festival to be announced tomorrow at 2:30 p.m., as well as San Antonio’s, this was good advice for me). 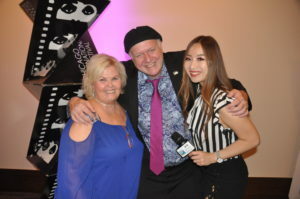 (l to r), Connie Wilson, Patrick of the omnipresent hat, and Meiling Jin, CEO of Studio Meiling Productions, LLC. (Photo by Studio Meiling Productions, LLC). Also on the program this night, besides awarding Kutza a Lifetime Achievement Award, would be bidding on a series of gala items, including a guitar signed by Tom Petty, a poster signed by the entire cast of the movie “Black Panther,” and a limited edition poster from the original “Star Wars” film (only 25 were made) signed by all the original “Star Wars” cast members.